« Privacy by Design – Principles or Requirements? Today, I enjoyed reading T.Rob’s post, “ Do you consider your digital identity a separate self or is it identical to your real-world self?” I started to respond to his post as a comment, but decided to write the following post. The remainder of this post comes from a couple of earlier posts – here and here. Thanks, T.Rob, for triggering these memories. Core Identity is the essence of who a person is. This unique “Core Identity” can be identified or described by attributes that belong to and describe an individual. Some unique characteristics (e.g. DNA signature, footprint) are immediately measurable at birth. Others change over time. Names. I am known by many names. My given name is Mark. My surname is Dixon. My i-name is MarkDixon.My social security number is [wouldn’t you like to know?]. My kids call me Dad. Characteristics. I have some measureable characteristics that don’t change – my DNA signature, my fingerprints. Others change over time – height, weight, hair color. Does IQ change? I don’t know. Relationships. I have relationships with people, institutions and things. I am father to my children, brother to my siblings, husband to my wife. I am an employee of Sun Microsystems and an alumnus of Brigham Young University. I own a Nikon camera. I love Chinese food. I can’t stand professional wrestling. Roles. The functions I perform in life are roles: Father, husband, Sun Identity Practice Lead, Identity blogger, Church volunteer, registered voter. Location. When I used to travel every week, I’d tell people I claimed home addresses in Mesa, Arizona and United seat 2B. These are descriptors of physical locations, relative to different known reference points. However, my current location (latitude, longitude, elevation) will vary, dependingon where I am physically located at any moment in time. Experience. I have experienced many things in the 52+ years of my earthly existence. I have been stabbed by a pitchfork, run for a touchdown, flown around the world and milked a cow (many times). Each experience adds uniqueness to my core identity. Knowledge. During my existence, I have amassed much knowledge, some of it shared by many, some of it unique. Both you and I probably know the Pythagorean Theorem. You probably don’t know the names of my kids. I hope you don’t know my blog password. Reputation. Other people and institutions say things about me, some of it good, some of it bad. The credit bureaus say I have a good credit rating. The DMV say I’m a so-so insurance risk because I’ve had a couple of tickets in the past three years – but they also say I hold a valid drivers license. BYU says I hold a BSEE degree. My wife likes me (and that is what really counts). Thanks for the response Mark, although the quote you picked was the second half of a 2-part idea. The first part was an argument that our core identities absolutely do change. It may be true that many or even most people’s core identity does not change but for every immutable marker you can name, I can probably cite an example of it changing. Even DNA. The thing that I most associate with identity though is a person’s character. @mgd is an identifier but the identity behind that pointer is what I really care about and that can change. My issue is that we assign things like SSN’s based on the assumption that a core identity is immutable and then judge the person in the present moment in part on actions and character of the person in the past, even when they are clearly not the same person. You and I may differ on whether it’s possible for the present and past person in the same body to be different. If you want to explore that further it probably warrants a fresh blog post. But for purposes of this reply I’ll just say I’m an example of the case for serial entities in the same body. The question for me isn’t whether it’s possible but whether it’s so rare that it can be ethically ignored for purposes of policy and law. I am having trouble with this. I was before, but now there’s more difficulty. My concern is with core identity as an “is.” There seems to be some granting of being to that notion that implies it can be known and distinguished. I had to run to the dictionary (well, ok, Wikipedia). It is interesting how much of the philosophical concern over identity is around the self, self-identification, and our sense of continuous personhood (changing or otherwise). That’s interesting to explore, but perhaps not so pertinent here. Then there are ways that we (ourselves) in some sense be models for theories that others hold. For example, I can demonstrate that I have control over the e-mail address for this login. I can demonstrate that I have control over the website associated with this account. Well, I can’t demonstrate by those means that I am a single individual person, and you can’t tell either. But there is more evidence that you, who controls this blog, and those who read this blog can satisfy that there is a single person involved and form some notions about how that person is evident in the world. It’s all plausible. I want to be cautious labeling any of that as a fixed thing. This puts me in mind of some amusing cases where I have been “mis-identified.” I am left to ponder how “identity-theft” and “impersonation” fit into this. The first may be a misnomer. It seems to me that neither the Digital Identity nor the Physical Identity, as characterized in the quasi-Venn diagram are real. Perhaps granting any reality to them is a is a mistake. I am pondering the degree to which what we’re struggling with is a matter of language and that there are useful connections that arise in connection with the linguistic situation and actions in the world. For example, I am not the e-mail address that I use as a sender and that I arrange to receive e-mail “at.” Yet it is extremely convenient that I can demonstrate control over that e-mail address. I have a digital signature that was confirmed by demonstration of that control. (The authority that stands behind that digital signature has made very limited claims about what the signature represents though. *They* don’t claim that this in any way identifies *me*.) Still, it is very successful in a number of ways that I participate in activities mediated by the Internet. What fascinates me (the poster here) is that “orcmid” is a more enduring and distinguishing identifier than what I think of as my official name, “Dennis Eugene Hamilton” shorter versions of which will lead to activities of others that are not the Dennis Hamilton the poster of this comment claims to be. “Orcmid” has been in continuous use since around 1980 and it gives me (the poster, if the claim is to be believed) the distinction of having an identifier that has remained unique on the Internet all of this time. (I have found some others, but not with the SEO-success that it has for me.) Dave Winer once suggested to me that he could disrupt that if he cared to. I suspect that Dave Winer has a different sense of who Orcmid (or Dennis) happens to be than either T.Rob or Mark. Thanks, T.Rob and Dennis. I appreciate you taking time to respond. First, my concept of a unique core identity is founded in my religious belief that each person is an eternal being, a unique, living entity that has always existed and will always continue to exist. Before our mortal birth, we existed as “intelligences” or “spirit children of our Father in Heaven.” We came to this earth to receive mortal bodies to house our spirits and have experiences and learn things we could only do in mortal life. Our spirits will leave our bodies at death and will continue to exist until the time of resurrection, when body and spirit will be re-united in a perfect form, and will continue through eternity. That is the essence of the Easter message. Within this context, perhaps a better term for “core Identity” would be “eternal identity” to indicate that each of us is a unique person – unlike any other – throughout eternity. I acknowledge that I don’t know of any immutable “marker” or “identifier” that is adequate to measure this eternal uniqueness completely. I don’t expect that you would share belief in these concepts that I accept on faith, but I thought it important to explain the foundation of my thinking. Now let’s focus on some other things in which we may have common ground. I agree that all people can experience great change during their lives. Attitudes, behavior and character can certainly change over time. Reputation, or other’s perceptions of individuals can change over time. Many dramatic examples exist of how folks with some pretty evil behaviors have transformed their lives into responsible citizens and vice versa. But all of us change over time to some degree. Although the name “orcmid” has not changed over the past many years, I’d guess that Dennis, the person orcmid represents, has certainly changed. T.Rob acknowleged that he has changed over time. I know that I have, although my inititals, “mgd” have remained constant for sixty years. So, for the purposes of identifying individuals, a fixed attribute, like a social security number, fingerprint or even a DNA signature certainly has its problems. Such attributes may point to a specific individual, but are inadequate to present the complete person. In this context, perhaps “Identifier” is a better term than “identity”. The classes of attributes I used in the Identity Map serve to categorize identifiers that accumulate in a person’s life over time. Using combinations of attributes is often more accurate to identify a person than using a single, fixed attribute. The teacher went on to explain the concept of symbols representing people or things and the use of symbols to represent numbers in algebra. 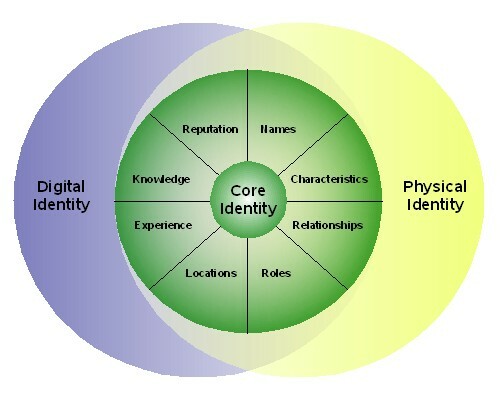 The Digital Identity and Physical Identity terms shown in the diagram in my blog post would more correctly be called “Digital Identifiers” or “Physical Identifiers.” Physical Identifiers are things like passports, drivers licenses, birth certificates – physical items or symbols that represent individual persons. Similarly, Digital Identifiers are digital representations of information that symbolically represent individuals. Perhaps we should rename this field of endeavor “Identifier Management”, because our systems certaily manage “Identifers” more than the “Identities” they represent. So, after saying all that, I suspect we are closer to agreement than it first appeared on the surface. Hi Mark – I just asked T.Rob if we could repost his article on our blog (blog.follr.com) and would love to also add yours if you will let us. We will clearly identify you as the writer and will link back to this source post. Please let me know if this is ok. Yes, thank you. You can certainly repost this post. You may want to consider including the comment thread as well. Thanks. That’s a great exploration. I have no quarrel with the notion of eternal being, whether or not I get discover that I am a temporal manifestation of one. I can completely align with identification and identifiers. It occurred to me (over on T.Rob’s turf), that these are distinguishers (in context and use by others). I know Kim Cameron is fond of “Digital Identity” and proposed laws therefore. I *think* I can grok that as long as I continue to rename things as I read along. PS: Thanks for moving the Submit button below the captcha. Thanks for your thoughts again. Let’s keep talking. And yes, having Submit below ReCaptcha is better. I’d like to find something better than ReCaptcha, but I haven’t found it yet.